So the calculation of service tax is changed as no input tax of Swacch Bharat Cess is allowed to MODVAT but Krishi Kalyan Cess modvat is allowed only to pay Krishi Klayan Cess. 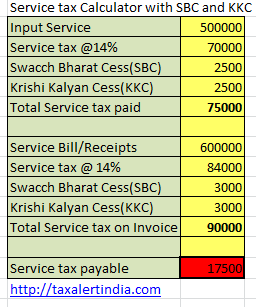 So there is an excel based calculator for calculating service tax after krishi kalyan cess introduced.The features of this calculator are as follows. This is an excel based calculator. Both input tax as well as invoice tax calculation done separately. Use online as well as offline. The PRADHAN SEVAK is supposed to be doin the Janta SERVICE...then Y is this "SERVICE TAX" charged? Just so that the PS can LOOT us?